Need a Rental? Auckland Airport Pickup? Corporate Event? Sports Games? Holidays? Papa Jai Has Your Van! We have many great new vehicles to choose from. All of our vehicles are clean inside and out, stylish, well maintained, and have lots of room! Need extra room for people, luggage, cargo, or both? 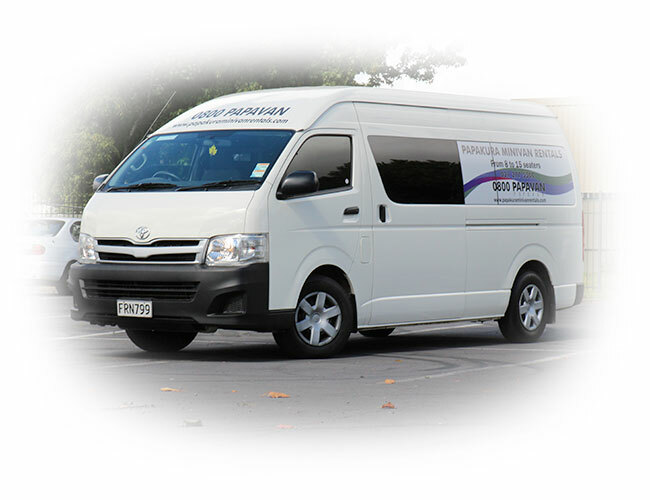 Papakura mini and passengers vans can seat up to 7, 8, 10, 12, 17, or even 20-23 passengers in comfort and style! Pakakura Vans are perfect for large groups traveling ‘cross town or across country’ as well as for your next vacation. If your need comfortable transport or weddings, engagements or other festivals, our green 2016 Holden (5 seater) is perfect. And we provide your driver! Select from a variety of great vans; we can meet your every need! Call Today! For years, Papa Jai has been providing excellent vans, with modern features,and lots of space for tourists,families, groups, and Kiwi couples enjoy their travels! At Papakura Mini Van Rentals, all of our vehicles are well maintained, spacious and comfortable, and offer great fuel efficiency. We are an easy 5-minute walk from the Papakura Train Station. Our clean vans are easy to drive, comfortable to sit in, and full of creature comforts (all at affordable prices). Call us Today at 0800 PAPA VAN, to reserve your vehicle. We can do a free pick up and drop off from/at Auckland Airport. If you want us to drop the van at the hotel you are staying, we can do so free of cost.